Well, change in plans, I didn't go out of town for the weekend. So I was able to help finish up this project yesterday. The Habitat crew was back: Eric, Roger, Tom, and Renee. New this week was Rick Reveal. It was only in the low 80's, but hazy and very humid. 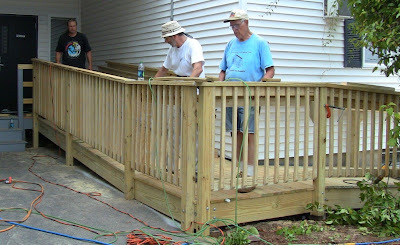 Renee, Tom, and Roger measuring for baluster railings. 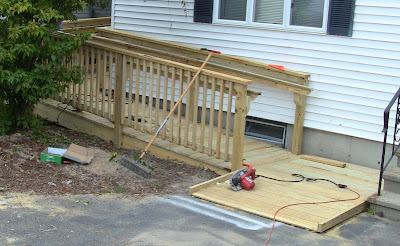 Rick trimming the pile of balusters to the proper length and angles. 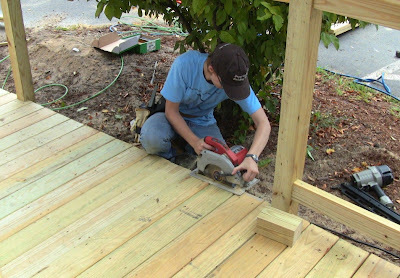 After I completed nailing the decking down on the lower ramp and landing, Renee trimming the ends even. 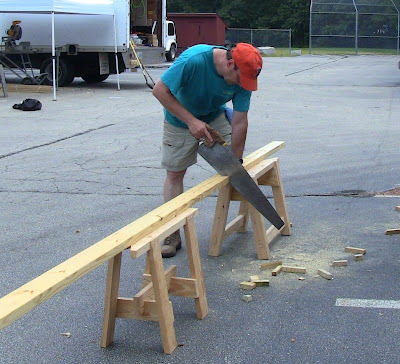 Using my antique crosscut saw while the two chopsaws were in use for angled cuts. One advantage of hand tools is that I was able to continue when the breaker tripped and we had to wait for someone to reset it! 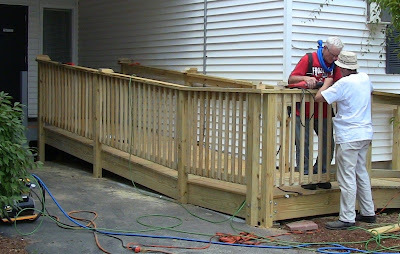 With the upper balusters in place, Tom and Eric working on one of the railings. 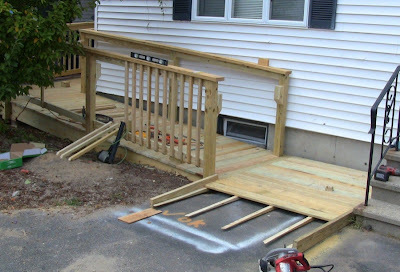 The final portion of the ramp awaiting decking. Eric secured these pieces with heavy duty construction adhesive and concrete nail gun into the asphalt. 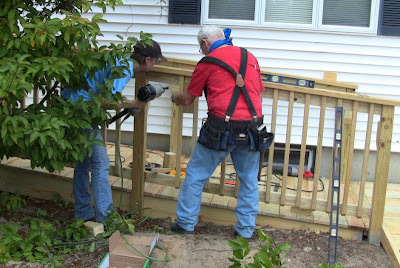 Renee and Tom finish up the balusters. 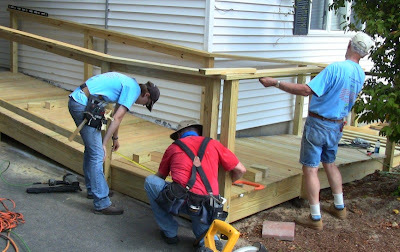 The upper ramp complete, while Rick, Eric, and Roger finish up the last bit of inside railing. 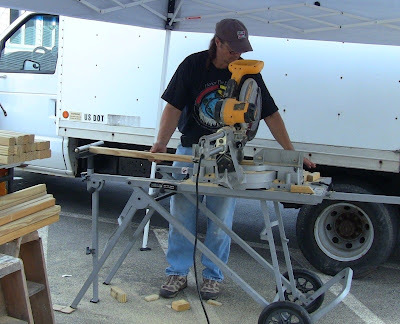 Rick smoothing off the sharp corners and rough spots at joints with a belt sander. I'm glad I got to finish this project. It was 18 hours total, a pretty simple one by typical Habitat standards, not a full build or rehab. 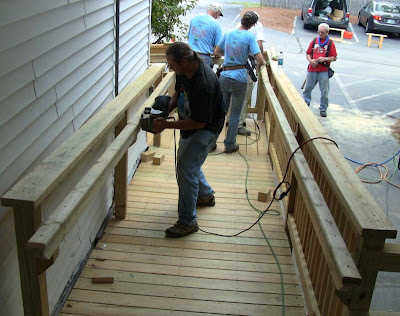 You can see that a full house can take months of labor from volunteers and sweat equity from the new homeowners.